Are you looking for a beautiful way to display your photos on your website? With the different options to choose from, how do you know which one is the right choice for you? In this article, we will give you a detailed comparison of image galleries: Envira Gallery vs Flickr vs SmugMug. You may have heard about various solutions for displaying photos on your website with style. Well, we’ve picked the top three photo galleries, so you can choose the best one for your images. There are several factors you should consider when choosing an image gallery for your photography website, including ownership, ease of use, customization, and speed/performance. In this comparison of photo galleries, we’ll take a look at each one, to see how the best image galleries stack up against one another. Envira Gallery is the best responsive image gallery plugin for WordPress. It allows you to easily add beautiful image galleries at your website. Envira has both free and premium versions available, and licenses for beginners to advanced users. With a broad assortment of features, Envira is well equipped to compete with any top-notch image gallery platform. To learn more about adding an image gallery to your website, you can check out our guide on creating an image gallery with thumbnails using Envira Gallery. Envira Gallery is self-hosted, so you have complete ownership and control over your photos. No one can report or delete them. Envira also offers a password protection addon, so you can create private galleries for your clients any time you want. To upload your photos in Envira Gallery from your WordPress admin, all you need to do is go to Envira Gallery » Add New. Then, simply drag and drop the photos you want into the Images section under Envira Gallery Options. Envira has tons of options for importing photos into your image gallery. They have an Instagram addon, a Dropbox addon, a ZIP importer addon and more, so you can easily import photos from your various accounts. You can even sync your photos with Adobe Lightroom, and set it to automatically create galleries from your Lightroom collections. Plus, if you’ve already uploaded images to your WordPress Media Library, you can use those for your galleries too. Envira Gallery has a collection of beautiful themes and templates that you can use to customize the appearance of your gallery layout. But the options for customization don’t stop there… You can also add social share buttons to your gallery, organize your galleries into albums, add a watermark to your photos, split your galleries up into multiple pages, add a Pinterest “Pin It” button to your images, and more. To edit the photos themselves, you can simply edit your images in WordPress before adding them to your photo gallery. Envira Gallery allows you to add multiple photos to your image gallery very quickly. You can simply drag & drop the images, and your photo gallery is ready. All of Envira’s plugins are well-built and robust, so they perform really well in terms of speed and reliability. For example, the optional lightbox feature is super quick to popup your image in a lightbox when clicked. Flickr is a free web app that allows you to create image galleries online. It is only accessible with a Yahoo! account. 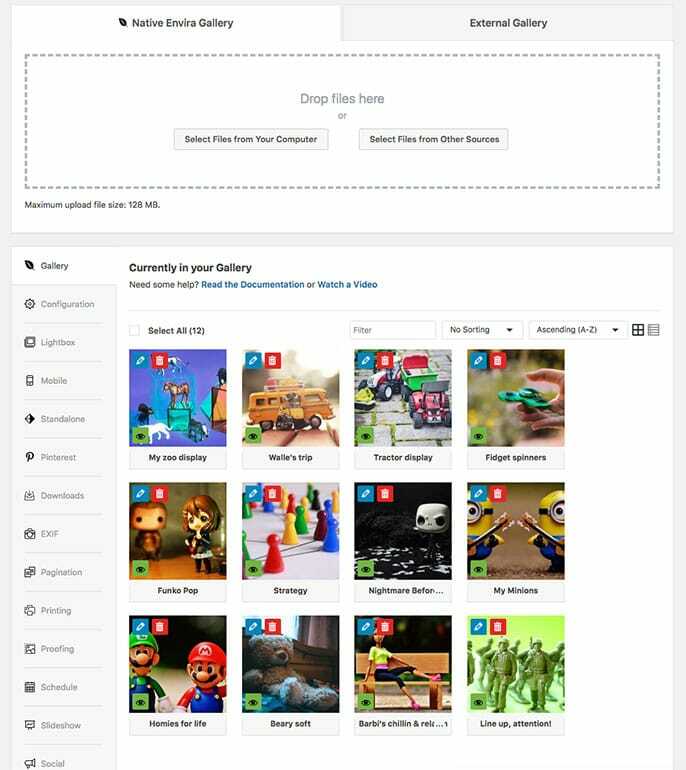 This flexible platform allows you to upload your images to the web and manage them. Flickr has multiple options, like photostream, albums, favorites and more. You can directly upload your photos to Flickr, or integrate it with other photo sharing apps, like Instagram. Flickr has a pro version with monthly and annual plans. This premium version comes with more advanced features, such as ad-free browsing, stats on your photographs, and more. Flickr is a third party app and is connected with your Yahoo account. If you lose your Yahoo account, or if it is inactive for a long period of time and they deactivate it, then you will lose all of your photos uploaded to Flickr. So if you decide to use Flickr, you will need to use your Yahoo/Flickr account regularly to keep it activated. If you do not upgrade to a Pro version Flickr deletes all your photos except your most recent 1,000 images. To upload your photos in Flickr, you’ll need to click on the upload icon in the upper righthand corner of your screen, next to your profile icon. That will open up a page where you can drag and drop your photos or videos from your desktop. You can also browse to select them from a file on your computer. You can integrate your Flickr account with Instagram, so when you upload the pictures on Instagram, they will automatically appear in your Flickr gallery. Flickr offers extensive customization for images. It has a third party editor called Aviary that allows you to add effects, frames, text and more to your photos. Flickr’s bulk image upload option is quite fast. Once the user clicks on any photo, it opens up quickly into a new page with thumbnails of other images. The lightbox also loads quickly. 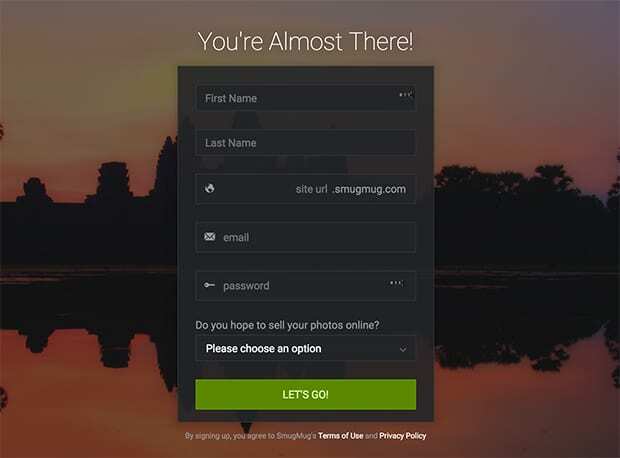 SmugMug allows photographers to create their own websites and upload photos. Your website is hosted at SmugMug.com with your selected username (e.g. myname.smugmug.com). You can upload, customize, organize, or even sell photos with SmugMug. SmugMug offers a 14-day trial version so you can test out the platform before you buy. They also offer paid basic and business licenses. You’ll get greater flexibility and control depending on which license you purchase. SmugMug hosts the data on it’s own servers, so you don’t have the ownership of your photos. If someone reports your domain, or if SmugMug decides to shutdown your account, then you will lose your images and all associated data. To upload your photos in SmugMug, you need to login to your SmugMug account with your username and password. Then, click on the upload button from the top menu bar. This will allow you to upload photos by browsing the files on your computer, or you can simply drag and drop them. You can also upload directly from your phone (for U.S and Canada users only), or from your Dropbox account. However, SmugMug’s navigation is a bit unintuitive, so you may need to spend some time understanding it. SmugMug has it’s own set of tools that allow you to crop, rotate, insert location, add color effects, and more. You can also add meta data and watermark data for each image individually. SmugMug is fast at uploading pictures and creating image galleries for you. It also has an option for controlling the image size, quality and speed for your users. Envira Gallery, Flickr, and SmugMug are all great image gallery solutions. We hope this comparison of image galleries has helped you to make the best choice for you. Also, you may want to check out our guide on 21 free web apps to grow your photography business. It seems you are incorrect about Smugmug having ownership of photos. Per their licensing agreement, this is not true. Their agreement states they are not the content owner. You should validate information about your competitor before assuming or intentionally lying about them. I’ve been looking for photo gallery software that contains 3 abilities that I thought would have been commonplace: host it myself, tag areas of a photo and add a date for timeline sorting. Little did I realize that this would be virtually impossible to find.